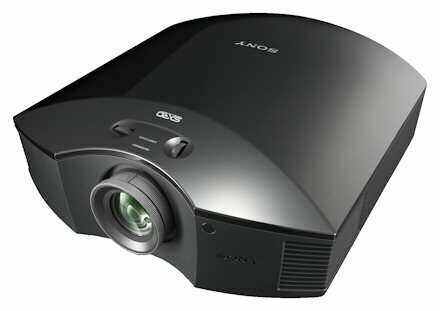 It all started several years ago when Sony revolutionized the home theater industry with the release of the VPL-VW50. This was the first full 1080p resolution projector with a breakthrough contrast ratio of 15,000:1, and a price tag that was within the budget of the average home theater enthusiast. Sony has done it again with the release of the VPL-VWPRO1. Building on years of consistent success with the Bravia Engine 2, Sony’s patented fully digital video processor, and combining that with their x.v.Color, which can display up to 1.8x the as many viewable colors as the existing RGB standard, the VPL-VWPRO1 takes image quality to an all new level. The VWPRO1 utilizes three enhanced, Full HD 1080p SXRD (Silicon Crystal Reflective Display) panels, improving brightness while reducing the screen door effect, and providing vivid colors, film-like image quality, as well as a depth of detail that rivals 3D . Sony has also added the ARC-F (All Range Crisp Focus) lens, a specially developed lens that takes full advantage of the SXRD panels, delivering superior clarity and focus. In combination with the Advanced Iris 3, it now has up to an 85,0000:1 contrast ratio, producing deep black levels with incredible image detail. With a 200w Ultra High Pressure lamp, the VPL-VWPRO1 delivers a brightness of 1300 ANSI lumens, making it usable in almost any home theater environment, especially when paired with the proper screen. Along with adjustable lens shift, and 1.6x zoom lens, placement and installation options are fantastic, without any distortion of the image quality.